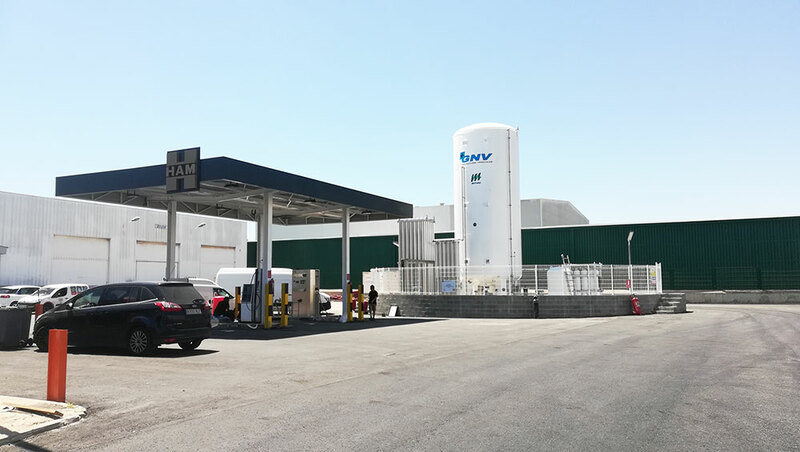 The HAM Group has launched a new public station for the supply of liquefied natural gas (LNG) and CNG compressed natural gas in the province of Barcelona. This new station is the first one located within the port of Barcelona and with this there are already 18 public stations operated by HAM. (15 LNG points and 13 CNG points). Although the official opening will be in the months of September and October, the station is already operational for the refueling of vehicles. Thanks to this new installation of HAM, LNG and CNG will be provided to port vehicles, heavy or light trucks, vans, taxi and passenger cars that have this alternative fuel, not only reducing their fuel operating costs but also supposes a new alternative for the traffic of the Port of Barcelona to reduce gas emissions and improve air quality in Barcelona. The station has a double jet of compressed natural gas and another of liquefied natural gas. In addition to the station in the port of Barcelona, the HAM Group plans to expand its network of LNG and CNG stations with the installation of new supply points in the peninsula. The most advanced according to the information that GASNAM has received are located in the communities of Aragón, Asturias, Castilla y León, Galicia and Extremadura. There are now 59 operating gas stations in Spain, which will soon be joined by 43 that are currently under construction. Currently, the HAM Group is a leader in the integral service of liquefied natural gas (LNG) and compressed natural gas (CNG), both in industries such as mobile-vehicular, maritime, etc., facilitating more effective and sustainable improvements in installations and supply of natural gas and bunkering services in the naval sector.